So this is wild. Amazon CEO Jeff Bezos' eponymous Bezos Expeditions has successfully recovered F-1 rocket engines – used during the Apollo missions – from the depths of the Atlantic Ocean. 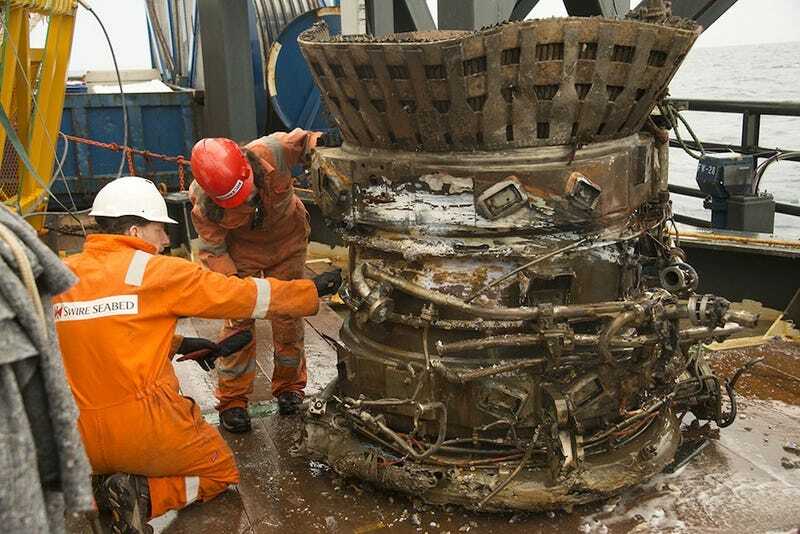 Pictured above, an F-1 Thrust Chamber can be seen aboard the vessel from which Bezos' team has spent the last several weeks working to recover these massive relics of the Space Race. What an incredible adventure. We are right now onboard the Seabed Worker headed back to Cape Canaveral after finishing three weeks at sea, working almost 3 miles below the surface. We found so much. We’ve seen an underwater wonderland – an incredible sculpture garden of twisted F-1 engines that tells the story of a fiery and violent end, one that serves testament to the Apollo program. We photographed many beautiful objects in situ and have now recovered many prime pieces. Each piece we bring on deck conjures for me the thousands of engineers who worked together back then to do what for all time had been thought surely impossible. The technology used for the recovery is in its own way as otherworldly as the Apollo technology itself. The Remotely Operated Vehicles worked at a depth of more than 14,000 feet, tethered to our ship with fiber optics for data and electric cables transmitting power at more than 4,000 volts. We on the team were often struck by poetic echoes of the lunar missions. The buoyancy of the ROVs looks every bit like microgravity. The blackness of the horizon. The gray and colorless ocean floor. Only the occasional deep sea fish broke the illusion. Featured below: video of a remote operated vehicle recovering the engines from three miles beneath the ocean waves, along with images of assorted engine components. "I want to thank NASA," wrote Bezos. "They extended every courtesy and every helping hand – all of NASA’s interactions were characterized by plain old common sense, something which we all know is impressive and uncommon." "We're excited to be bringing a couple of your F-1s home." Check out the rest of Bezos' entry, along with many more photos, over at The Bezos Expeditions Blog.